Ahead of the United Nations Climate Change Conference (COP21) in Paris on Dec. 7-8, conceptual artist Naziha Mestaoui gives us 1heart1tree, an art project that reforests the planet as more people contribute. Brought to life after a successful Kickstarter run, the idea is simple but also remarkably personal: You download an app, then use its sensor to take your heartbeat. Between Nov. 29 and Dec. 4, a virtual tree will blossom around the Eiffel Tower, growing to the rhythm of your heart. 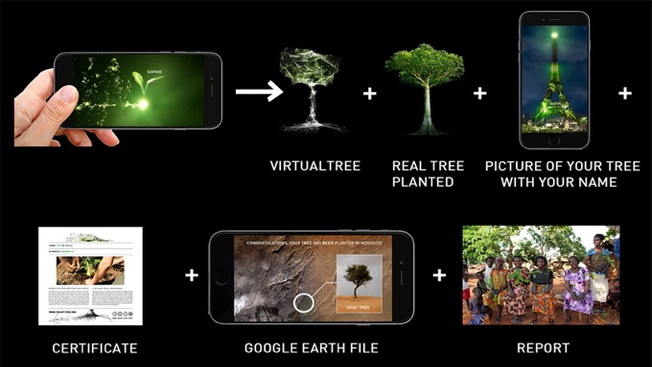 You'll be able to watch it live from your app and share it online—and better yet, a real tree will also be planted in your name someplace in the world. 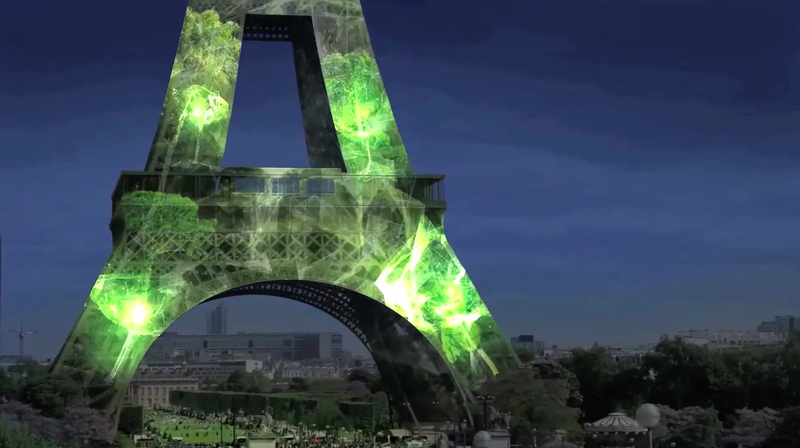 The app, developed using real-time 3-D software Unity, uses 3-D interactive mapping technology to produce a unique tree with your heartrate and project it live onto the Eiffel Tower, using 30 video projectors. "The entire 3-D environment will be calculated in real time on a central server receiving all the information from the database fed by the phone application to generate all the trees," according to Mestaoui. Names or words of the user's choosing will appear alongside the trees for a short period of time, composed of 16 characters maximum and lasting from 8-45 seconds before vanishing. The app is still in prep mode, but users who reserve a tree will get an email once it's live, roughly around mid-November. Each participant gets a photo of their virtual tree with their name on the Eiffel Tower, a certificate, and a Google Earth file that highlights where your actual tree was planted. Even more ambitiously, for the next three years, you'll get a twice-yearly report about how the project is doing, enabling you to "stay in touch" with your tree. Think of it as an eco-friendly Tomagotchi that won't die if you fail to wake up at 6 a.m.
Over 45,000 trees have already been reserved, according to the website, but they're shooting for participation in the millions. Partners include the City of Paris, the United Nations FCCC and the French presidency. Eight reforestation partners have been tapped, and project ambassadors will be announced soon.